This release of Json.NET adds annotations to LINQ to JSON. Annotations allow you to associate arbitrary objects with LINQ to JSON JObjects, JArrays and JValues. Annotations aren’t part of the JSON specification; they aren’t read from JSON or written to JSON. Annotations are for use within an application. In this example we use annotations to track changes to a JObject. First a set of strings for is associated with a JObject using annotations. The PropertyChanged event is then used to add a property name to the set whenever its value is changed. The JObject’s changed properties are now easily accessible anywhere in your application from the JObject. Here is a complete list of what has changed since Json.NET 6.0 Release 6. Json.NET now supports running on the ASP.NET CoreCLR, a coming soon server optimized CLR for running applications in the cloud. Today, you run ASP.NET using the same CLR that desktop apps use. 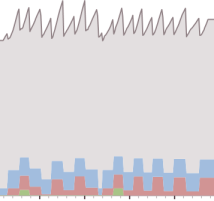 We’re adding a cloud-optimized (my cloud, your cloud, their cloud - server stuff) version optimized for server scenarios like low-memory and high-throughput. ASP.NET vNext will let you deploy your own version of the .NET Framework on an app-by-app-basis. One app with new libraries can’t break an app next door with a different version. Different apps can even have their own cloud-optimized CLR of their own version. The CLR and cloud-optimized libraries are NuGet packages! Bin deploy ASP.NET to a Mac or Linux server? Sign. Me. Up. Find out more about the ASP.NET CoreCLR and ASP.NET vNext here. This release of Json.NET optimizes memory usage, in particular heap allocations when reading and writing JSON. Json.NET has always been memory efficient, streaming the reading and writing large documents rather than loading them entirely into memory, but I was able to find a couple of key places where object allocations could be reduced. Deserialization saw the biggest improvement with about a 35% decrease in allocations. Less allocations, less garbage collection. Less garbage collection, more requests per second. 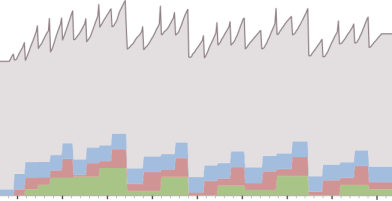 Grey is unmanaged memory, blue is the Gen0 heap, red is Gen1, green is Gen2 and the profiler used is dotMemory. Here is a complete list of what has changed since Json.NET 6.0 Release 5. The most visible new feature in this release is the ability to quickly merge JSON using the Merge method added to JObject and JArray. The logic for combining JSON objects together is fairly simple: name/values are copied across, skipping nulls if the existing property already has a value. Arrays are a bit more tricky in how they can be merged so there is a setting for you to specify whether arrays should be concatenated together, unioned, merged by position or completely replaced. The low-level ConstructorInfo properties on JsonObjectContract, used when creating objects during deserialization, are now obsolete and have been replaced with functions. Also Json.NET no longer immediately throws an exception if it tries to deserialize an interface or abstract type. If you have specified a way for that type to be created, such as resolving it from a dependency inject framework, then Json.NET will happily continue deserializing using that instance. These changes combined make using Json.NET with dependency inject frameworks like Autofac, Ninject and Unity much simpler. There have been a lot of small performance improvements across Json.NET. All reflection is now cached or compiled into dynamic IL methods, large XML documents are converted to JSON much faster and JObject memory usage has been reduced. Here is a complete list of what has changed since Json.NET 6.0 Release 3. Json.NET 6.0 added support for F# discriminated unions - this release adds support for F# collections. F# lists, sequences, sets and maps now serialize and deserialize automatically. To all future creators of immutable .NET collections: If your collection of T has a constructor that takes IEnumerable<T> then Json.NET will automatically work when deserializing to your collection, otherwise you're all out of luck. Internally this setting will instruct the serializer to load the entire JSON object into memory. Metadata properties will then be read out of the object, and then deserialization will continue as normal. There is a slight cost in memory usage and speed but if you require a feature that uses metadata properties and can't guarantee JSON object property order then you will find this useful. DateFormatString is now used as a fallback when parsing dates during deserialization, lots of bug fixes, and a couple of small but significate performance improvements. Here is a complete list of what has changed since Json.NET 6.0 Release 2. Json.NET has supported basic path queries with SelectToken since forever. Json.NET 6.0 supes up SelectToken with full support for JSONPath, an XPath like querying language for JSON. A SelectTokens (plural) method has been added for returning a range of results from a JSONPath query. While LINQ to JSON offers more features and flexibility, JSONPath being string based makes it a good choice for persisting a queries or constructing dynamic queries. Json.NET 6.0 adds support for serializing and deserializing F# discriminated unions. There is nothing you need to do, F# discriminated unions will now Just Work. Json.NET has had a static assembly version since 4.5 to avoid binding redirects. The problem with having a static assembly version is if a strongly named assembly with the same version number is found in the GAC, the GAC version will be used ahead for the /bin version. Some people have been encountering the problem that their applications break when someone else GACs an old Json.NET 4.5 on their server. I’m looking at you .NET CMSes. The plan going forward is to increase the assembly version with major Json.NET releases. 6.0 Release 1 –> 6.0.0.0, 6.0 Release 2 –> 6.0.0.0, 7.0 Release 1 –> 7.0.0.0. Hopefully this will provide a balance between binding redirects and having the GAC ruin your day. Tons of smaller features like parsing single line comments in JSON, reading multiple pieces of JSON content from a stream with one JsonReader, obsoleting of bad methods and lots of bug fixes. Here is a complete list of what has changed since Json.NET 5.0 Release 8.